If you’ve ever been to Hope’s Corner, you’ve probably seen Mikey. He’s a regular guest who enjoys our hot breakfasts and uses our showers. To give back, Mikey helps at Hope’s Corner most Saturdays by setting up tables and chairs, tearing down after breakfast, and sweeping and mopping the floor. 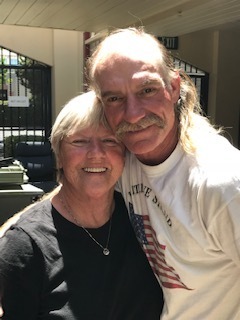 Although Mikey is still trying to “find himself”, Hope’s Corner has helped him find someone who is very dear to him – his mother. Mikey was born to a teen mother who gave him up when he was very young. He was put into the foster care system and bounced through nine different foster families. Occasionally, his mother would visit, usually around Easter. Then at age 10, while living with a foster family, he accidentally shot and killed his foster brother while playing with an unsecured gun. This tragic event left deep emotional scars. Mikey never saw his mother after the accident. Shortly thereafter, Mikey was adopted and raised by a caring special education teacher who understood Mikey’s challenges. Although Mikey attended and graduated from Mountain View High School, Mikey bore the weight of enduring an unstable and chaotic childhood and having no connection with his birth family. He struggled with authority and wound up in prison, even spending time in San Quentin. Ultimately, he found himself homeless and a drug addict. Until earlier this year, Mikey had pretty much given up on finding his mother. However, Hope’s Corner volunteers found a website with experienced staff who located his mother in Boise, Idaho. After a few happy phone calls, Mikey reunited with his mother in July when she paid a visit to Hope’s Corner. This reunion filled a large void for Mikey.